ICO (Tuomo Prättälä) was originally composed for the group Bonksters albeit under the name "Night of the Living Caravan". Through repeated performance, this initially melancholic ballad ultimately became the energetic camel gallop heard on this recording. Anchor Song (Björk), or "Um Akkeri", is one of the two songs that Ilmiliekki Quartet has borrowed from the pop and rock genre. The version released on Björk´s first solo album (Debut, One Little Indian) already had a personal and appealing atmosphere based upon which Ilmiliekki Quartet´s version was spontaneously created. Old May Become New (Verneri Pohjola) makes clear, through its title, that this composition is an older work, now presented in a new form. Only the piano figure has survived from the original composition called "Cheap Beer". Otherwise, the song as a whole, with its melodies and its various sections as well as its structural decisions, is new. Answer Kalho, Answer (Olavi Louhivuori) had its beginning in an idea that came to its composer while playing the piano late at night in the fall of 2002. The composition is based only on a few phrases. In fact, "Answer Kalho, Answer" is more like a lucid, peaceful scenery of sound created with Ilmiliekki Quartet in mind than a structured composition. Monastery (Tuomo Prättälä) is a sketch-like song that is being played as if still being outlined by the musicians. As the only duo performance on this record, its general tone is a bit lighter and easier to approach than may be the case with some of the other compositions. Based on Tuomo Prättälä´s initial sketch, the song took its final shape through joint improvisation. March of the Alpha Males (Verneri Pohjola) is, as its name indicates, arranged as a type of a march. The composition hovers between gallantry and non-deliberate humor. The trumpet is played with a straight mute, which today is more often heard in classical music. Melankolinaa (Tuomo Prättälä) presents a melancholy landscape which is transformed into an empty bullfighting ring. Glimpses of America can also be heard. Blue Jyväskylä (Verneri Pohjola) was composed before the founding of Ilmiliekki Quartet. The song carries, in its name, the location of its premiere performance, the town of Jyväskylä in Central Finland. This tune was also one of the very compositions around which Ilmiliekki Quartet was initially founded. 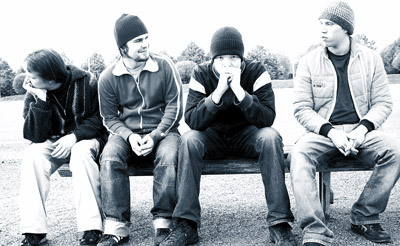 The Tourist (Radiohead) was adapted into Ilmiliekki Quartet´s repertoire from Radiohead´s "OK Computer "album (Parlophone). Although it was a challenge to borrow from an album that had become an instant classic, Ilmiliekki Quartet wanted to create its own version of this particular song. What Reason Could I Give (Ornette Coleman) was originally included on Ornette Coleman´s classic album Science Fiction (Columbia). Ilmiliekki Quartet´s version was, however, inspired by trumpeter Don Cherry´s and pianist Bobo Stenson´s duo version of the same song (Dona Nostra, ECM).